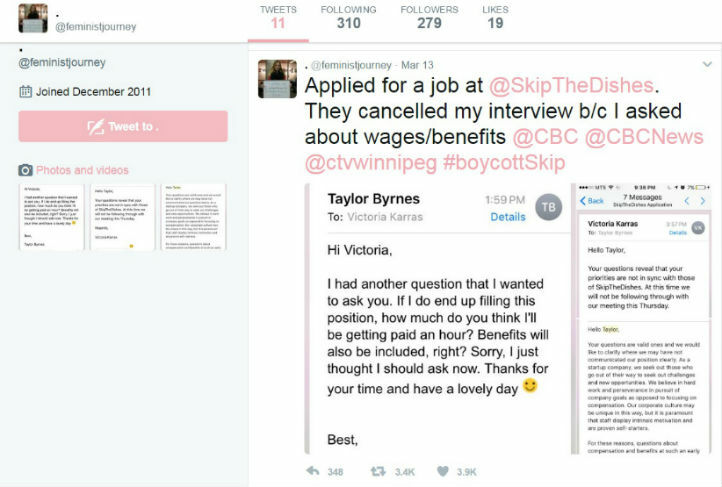 WINNIPEG (CP) -- SkipTheDishes is apologizing to a woman and offering to reschedule a second job interview that was cancelled after she asked about wages and benefits. Taylor Byrnes of Winnipeg tweeted a screenshot Sunday of an email exchange with Victoria Karras, a talent acquisition co-ordinator with the online food delivery company. Karras said in her reply that the questions revealed the applicant's values were out of sync with SkipTheDishes. She called off a meeting that had been scheduled for Thursday. Karras followed up with another message that said the startup company believes more in hard work and perseverance than in focus on compensation. ``Our corporate culture may be unique in this way, but it is paramount that staff display intrinsic motivation and are proven self-starters,'' Karras wrote. Byrnes said the back-and-forth with Karras happened after she'd done a phone interview, which went well. Her tweet went viral. Many Twitter users voiced their support for Byrnes and some threatened to boycott SkipTheDishes. ``Good thing you found out now; that's code for we need to exploit your labour for as much as possible,'' Kim Siever wrote. SkipTheDishes co-founder Joshua Simair said the email to Byrnes was wrong and does not represent the company's approach or values. ``We are very disappointed in how it was handled. We do share a compensation package prior to hiring. As soon as we became aware of it on Monday, we reached out to Taylor to apologize for the email and reschedule her interview,'' he said in an emailed statement. The online food delivery company, founded in Saskatoon and with headquarters in Winnipeg, was sold to a company in the United Kingdom for $110 million in December.